Families can own a Marcraft home in three ways: choose from Marcraft Vancouver Home’s existing inventory, custom build on a Marcraft lot, or have Marcraft Homes build their dream house on their own Lower Mainland lot or home site. New show homes are opening in Anmore’s Ridgewood estates and Copper Beech Estates in Burke Mountain in the Spring 2010, so this is your chance to own a single family Vancouver home that is custom built and designed for you in mind. Constructing Vancouver homes may be an industry, but Mark and Marcraft Home builders are dedicated to making the process anything but industrial. “A family company building for families,” Mark and his team built every Marcraft Home in Vancouver rela estate market like it’s their own. Uncompromising commitment to quality beigns with the choicest locations in the Vancouver market. Marcraft Home’s unique designs complement the homesite and lot while satisfying the needs and aspirations of their clients. In addition, balancing the latest products with eco-friendly practices and natural elements, Vancouver Marcraft Homes creates residences with a unique west coast identity that boast every modern convenience while respecting the environment that surrounds them. Until Spring 2010 when the official re-launch of the Anmore Ridgewood Estates homes and lots as well as the grand opening of the Burke Mountain Copper Beech Estates takes place, you can learn more about the Vancouver Marcraft Homes builder onlnine at macrafthomes.com. Picture perfect setting for your dream home with only 6 lots remaining here at the Marcraft Anmore Ridgewood Estates. Display homes are now under construction for a grand re-opening in Spring 2010! Ridgewood Estates Anmore real estate development community is a prestigious collection of the most desirable one acre Anmore estate lots available today in the Greater Vancouver market place and released by boutique Marcraft Homes Vancouver builders. Featuring majestic views facing south east with Mount Baker in the background, the Anmore Ridgewood Estates lots for sale are just thirty minutes from Vancouver downtown and surrounded by natural beauty with pure lakes, parks, beaches, picnic areas, hiking, biking, horse trails, services and amenities nearby. All Marcraft Ridgewood Estates Anmore lots for sale are serviced underground and are ready for building today! Custom design your dream Vancouver home with the help of resident builder Marcraft Homes Vancouver builders or bring in your own builder. Call today for your private tour of the new Anmore Ridgewood Estates lots for sale and also to get a detailed price list on remaining Anmore lots here. Visit ridgewoodestates.ca today for more information. Also, you can also visit this link for details about the new Ridgewood Estates Anmore lots community [look further down the page]. A very prestigious collection of the most desirable one acre estate lots in the Lower Mainland are available today at the Anmore Ridgewood Estates community. Featuing majestic mountain views facing south east with Mount Baker in the background, the Ridgewood Estates Anmore real estate development is just thirty minutes from downtown Vancouver and surrounded by natural beauty with pure lakes, parks, beaches, picnic areas, hiking, biking and horse trails just seconds away. All of the new Anmore lofts for sale at Ridgewood Estates community are serviced underground and ready for building your dream home. 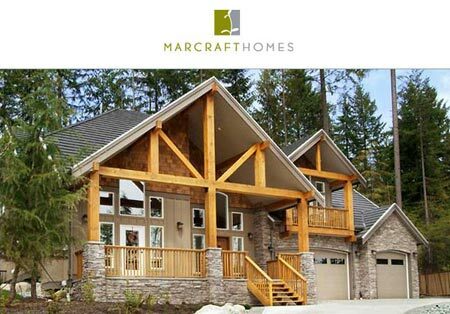 Custom design your dream Anmore home with the help of resident builder Marcraft Homes or bring in your own builder. Call today for your private tour of the new Anmore Ridgewood Estates lots for sale an dthe price list on remaining homesites. 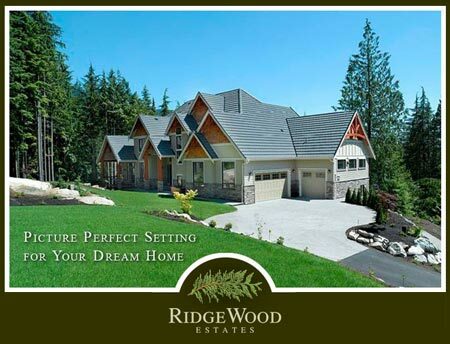 The Ridgewood Estates Anmore lots start from just $599,900 and the finished homes range from $1.429M. This is the picture perfect setting for your dream hom with only 5 lots remaining! For details about this Anmore real estate development, please visit www.ridgewoodestates.ca and for sales information, please contact Andrea at 604.783.3124. Now selling sven exclusive estate Coquitlam homes for sale in the Burke Mountain community. These distinctive custom home designs with superior finishing packages on estate lots is a once in a lifetime opportunity, here at the Marcraft Homes Copper Beech Estates on Burke Mountain. The display home is under construction and will be ready this Spring 2010. For more information, you will need to contact Andrea or Michael at 604.783.3124. Now selling, the Burke Mountain Coquitlam Copper Beach Estates are open Monday to Thursday from one to four, weekends from noon to four and closed on Fridays. As a Vancouver home builder and well established/respected developer and designer, Marcraft Homes specializes in many areas that are unique, innovative, environmentally friendly, functional and design oriented with exquisite finishes and modern features. All Vancouver Marcraft Homes evolve with the site, needs and requirements of families in addition to the grade, green space, sunlight and other homesite attributes. Standard desired features in a Vancouver Marcraft Homes include such design specialties as master bedroom retreats with spacious luxurious ensuites, media rooms, butler stations, nanny spaces, wine rooms, stunning two storey great rooms and elobarte basement bars. In addition, some of the unique design specialties by Marcraft Homes Vancouver builders and real estate developers includes natural rustic materials that give a rich and visual textual appeal to exteriors and comforting interiors, vaulted ceilings that give more space, large customized windows that maximize views and natural lighting into your homes as well as unique ceilings detailing and fireplace surrounds. Other developer design specialties of the Vancouver Marcraft Homes builders includes custom freestanding staircases in addition to innovative kitchens with high-end, state of the art appliances, countertop materials and cabinetry. As a Marcraft Homes Vancouver builder client, your new Vancouver home is covered by their 24 hour emergency service department and customer care. All new Marcraft Homes come with a 1-2-5-10 Year Warranty. The head office of Marcraft Homes Vancouver builder is located Port Coquitlam, BC.